In 2005 a 20-hour fire destroyed large parts of Elmau Castle near Garmisch-Partenkirchen in Germany. The fire was so severe that four million litres of water were used to put out the flames. 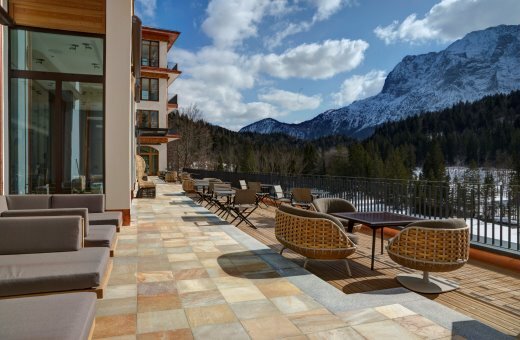 Thanks to the efforts of the owners, the luxury hotel was rebuilt however in time for the G7 summit to show it in all its glory – as well as the completion of the new Elmau Castle Retreat. 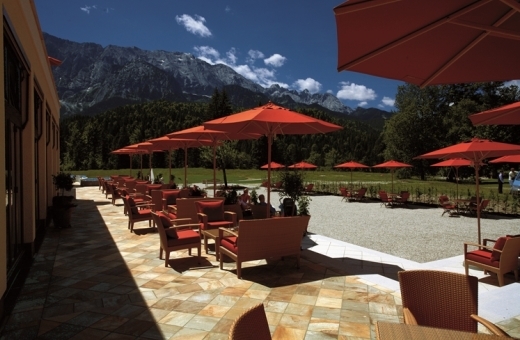 Gutjahr System Technology for external tiling, now available from BAL – the UK’s market-leader in full tiling solution – played a vital role in protecting the balconies and terraces of both hotels. On 7 and 8 June 2015 when David Cameron, Angela Merkel, Barack Obama and the other leaders of the seven leading industrial nations strolled around Elmau Castle all memories of the great fire had long been forgotten as the castle emerged like a Phoenix from the ashes. Following the fire, castle owner Dietmar Muller-Elmau invested around €40million to rebuild the listed building. Together with architect Christoph Sattler, a cousin of Mr Muller-Elmau and grandson of the original builder of 1914, and a team of other architects and designers, a concept was developed for a modern spa hotel within the ancient walls. The result was a modern, five-star superior luxury. It is now one of the “Leading Hotels of the World” and has been recognised as such several times. In March 2015, the additional Elmau Castle Retreat was opened 150 meters west of the castle hidden in the hillside. From the balconies and terraces of the new building, the politicians of the G7 summit were presented with a breath-taking view of the nearby Wetterstein Mountains. As part of the renovation it was proposed to cover the balconies and terraces with Brazillian quartzite tiles. For six months contractors worked at the castle – up to 45 men at peak times – to complete the tiling. Rising to 1,000 meters above sea level, the castle faces extreme weather conditions including cold winters, excessive rain fall and variable temperatures. Since the natural stone specified is particularly sensitive, precautions were necessary to protect it from ugly efflorescence and water staining. Experts recognised this in advance and so specified the AquaDrain EK drainage system for external tiling – now available from BAL. AquaDrain EK is a passive capillary surface drainage matting, designed for the installation of natural stone, tiles and slabs on drainage mortar on balconies, terraces and roof terraces. The combination of drainage mortar and drainage mat is recommended by the German Natural Stone Association in its literature. This is because studies have shown that the drainage capacity of drainage mortar is not enough and can cause problems with the installation of drain grates. The AquaDrain EK drainage mat channels water effectively away from the surface, avoiding any damage. Ventilation underneath also ensure the lining dries faster, while the mesh fabric remains permanently permeable to water without permitting the entry of mortar or cement which could block the capillary system. A crucial part of the re-build was the transition from the balconies and terraces to the interior of Elmau Castle. German regulations state that transitions between interior and exterior tiling should be at least 150mm, to prevent water running behind the seal and entering the interior. However due to the architectural approach of the luxury hotel, this was impractical, requiring a solution only Gutjahr could fulfil. With special drain grates made of stainless steel, transitions were reduced to a more convenient 50mm, while still meeting building regulations and at the same time ensuring interiors are kept dry. Thanks to the AquaDrain drain grates, water is captured at the transitions and directed into the attached surface drainage mat and away from the balcony or terrace. AquaDrain drain grates are extremely flexible being easily height adjustable and easy to cut to length on site. 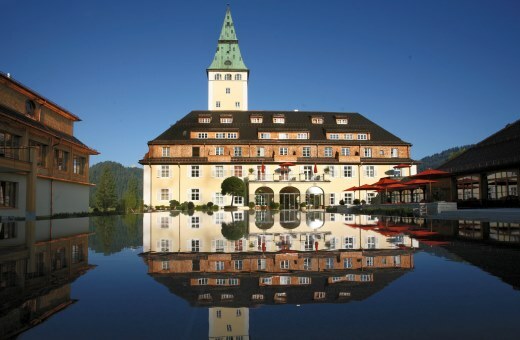 Six years after the re-opening of Elmau Castle, construction began on the second hotel. “The balconies and terraces of the parent venue were still in perfect condition,” said Ralph Johan, Gutjahr Managing Director. No sooner said than done: on 400 square meters of terraces, Brazilian quartzite was also protected against the elements with AquaDrain EK. Gutjahr System Technology from BAL represents drainage, ventilating and uncoupling solutions for balconies, patios, terraces and on facades and interiors. Its innovative technology helps protect external installation from frost damage, staining and water damage. For more than 25 years, BAL’s sister company Gutjahr have developed long-lasting trouble-free coverings even on problem substrates throughout Europe from prestigious projects including Amsterdam Library, The Palace of Hambach, and the Weimar National Theatre, to small domestic projects.